When it comes to relaxing in the great outdoors, one definite must-have is the hammock. These laid-back fabric swings provide us with fantastic seating or a cozy bed while being protected from the cold nighttime ground. Buying a quality hammock can certainly be a lot more hassle than you may have originally anticipated due to there being such a wide variety of models currently available on the market. This article aims to take some of that work off of your hands by reviewing one of the more popular hammocks around, the Lost Valley Camping Hammock Bundle from Oak Creek Outdoor Supply. By the end of this review, you should have a clear understanding as to what this hammock has to offer and whether or not it is the right one for you. Oak Creek Outdoor Supply prides themselves on standing for everything outdoors—whether you’re heading out for a hard day of hiking or you’re simply having a barbecue in your backyard. They see their products providing a level of quality that delivers functionality and durability no matter what the activity is. The Lost Valley Camping Hammock Bundle does exactly this. It delivers everything someone may need to get started right away. This hammock can be unpacked and instantly deal with a variety of situations that other hammocks may not be prepared to handle. It can be used right out of the box without the need to purchase additional accessories. This camping hammock bundle is the best for first-time buyers who want a hammock that they can take out of the box and use right away. It’s also great for those who need a hammock with a bit more versatility. With accessories already included, buyers can rest assured that this hammock is ready to take on a range of weather conditions. The more budget conscious of us would also benefit from this camping hammock bundle as it is priced extremely low for its class, considering all of the added benefits included. In this camping hammock bundle, you will find the hammock itself, two tree straps, a rain cover, a mosquito net, two 12KN carabiners, two stakes, and two guidelines. All of these fit into a very convenient travel bag. Convenience: Despite coming with a healthy amount of accessories, this hammock compacts down into a very manageable 14-by-8-inch travel bag, letting you store it or attach it to your gear bag easily. Easy Strapping System: With its simple strapping system, this hammock can be set up at your campsite in less than 10 minutes. Durable Construction: This hammock is made from a highly durable, tear-resistant nylon and also benefits from reinforced stitching and knotting at each end for an enhanced life expectancy. Lightweight: Weighing only 3.6 pounds in total, this camping hammock is incredibly lightweight and portable. Maximum Weight: Even though this hammock is only a single-sized hammock, it has a relatively high maximum weight capacity of 350 pounds. Added Extra: As an added extra, this hammock also includes a small pocket on the inside to prevent you from losing your mobile phone or other valuables. Camping hammocks are extremely intuitive in terms of how you use them and when it comes to setting them up. However, they can be a little more troublesome for other people. The first thing you’ll want to do is attach the straps to two trees approximately eight to 10 feet apart from one another and at your head height. As a side note, always remember to attach them to trees with a diameter above 15 inches. There are a variety of different strap systems currently around so follow the instructions provided with your hammock. Typically, you’ll simply need to hook and loop the straps. Once that’s done, you’ll then connect the straps to the hammock itself, pulling the bottom end as you do so. If you need to connect mosquito net lines, you’ll usually place these around two feet higher than the straps. When looking to buy your camping hammock, it’s important to get an idea of other models that are also currently available. In this way, you can rest assured that you are getting the right product for your needs. For those looking for something with a bit more room, then you might want to take a look at the Sunyear Double Camping Hammock. Measuring in at 10 feet long and 6 feet wide with a maximum weight capacity of 600 pounds, you’ll easily be able to fit two adults in it comfortably. Not only does this hammock offer a bit more size, but it also offers an extremely durable construction using the likes of solid steel carabiners and 210T parachute-grade nylon. If you’re perhaps more budget-conscious and this is your first camping hammock purchase, you’ll want to pick something at more of an entry level. In this case, you might want to take a look at the Gold Armour XL Camping Hammock. This hammock offers a great amount of room at a very affordable price. You do lose out on the mosquito net alongside a couple of other features, but these features can be added if necessary at a later date. 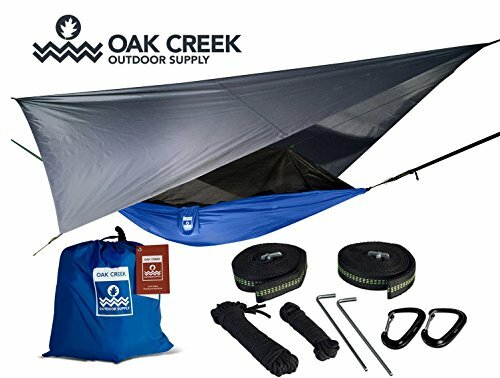 The Lost Valley Camping Hammock Bundle from Oak Creek Outdoor Supply is not only a fantastic starter hammock but also offers everything that a more seasoned hammock buyer would look for in a quality hammock. Boasting not only quality construction but also functionality at such an affordable price, this camping hammock bundle is, indeed, a true bargain.